NAATI CCL Test determines a candidate’s ability to transfer the meaning of what is said by each speaker in the other language (i.e. English into LOTE and vice versa). A candidate can claim 5 bonus points for Australia PR Visa application on achieving the required score in NAATI CCL Exam. Punjabi, one of the fastest growing languages spoken in Australia, is included in the list of Language Other Than English (LOTE) for the Credentialed Community Language (CCL) Test. 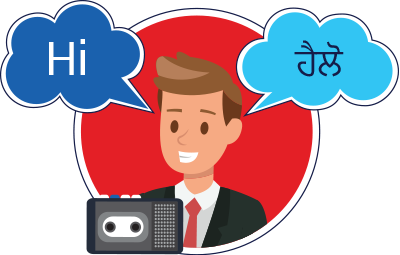 For Punjabi CCL Assessment Test, a test taker needs to demonstrate equal competency in both the languages – English as well as Punjabi. With our experts, learn & understand right from the basics. With exhaustive mentoring and provision of various resources, you will not fall short of achieving your PR. With NAATI CCL Punjabi Online Coaching and NAATI CCL Punjabi In – Class Coaching(Only in Melbourne) your PR dream is not too far! For the candidates looking forward to appearing for Punjabi CCL Test, the practice materials provided here will certainly benefit in theirCCL Test preparation. They are comprehensively designed to give an idea about the actual test. The Practice Materials comprise of dialogues. The dialogues are aimed to provide a real-like exam experience for the candidates. You will hear two dialogues between an English speaker and a Punjabi speaker. You are required to interpret into the other language what each speaker says. As soon as each speaker finishes a segment, you hear this signal (chime). You may take notes if you wish. You should begin interpreting only a few seconds after you hear the signal. Read articles that demonstrate the real-life scenarios of an Australian society (laws, health, education…). Learn new words, understand their meaning and try to use them while you speak. Practice with a study partner. Ask them to read some short passages. You can then reproduce the same in English as well as Punjabi. Attempt CCL Practice Tests, record your responses and listen to them. This will help you analyse your own performance and improve.